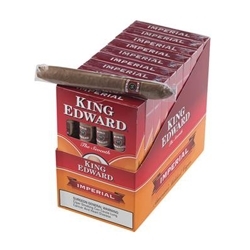 King Edward Imperial cigars are mild-bodied machine made smokes that offers subtle flavors with a smooth draw. Imperial cigar consists of a special blend of tobacco derived from four different countries and encased in a natural leaf wrapper, allowing for a complex combination of tastes you won't soon forget. King Edward Imperial cigars offer excellent taste, price, and quality every time. Available here at Smokers Discounts!